The nerve effects of Bell's palsy are peripheral, while in a stroke, the nerve effect is central. As you can see in the figure, motor innervation in the forehead comes from both cerebral cortex hemispheres. A stroke with symptoms of facial paralysis would show drooping only in the lower part of the face, as the forehead would still be receiving motor innervation from the brain hemisphere that is unaffected. In Bell’s palsy the forehead becomes paralyzed as well, as the peripheral lesions affect the innervation of both hemispheres. These symptoms are brought on by swelling, injury, and facial nerve ischemia (CN VII). The exact reason is unidentified, but it may be linked to a viral infection. An acute ischemic stroke occurs when there is an obstruction in the artery that supplies oxygen to the brain. The onset is sudden and becomes severe in just seconds or minutes. The affected artery and location will determine the symptom pattern. 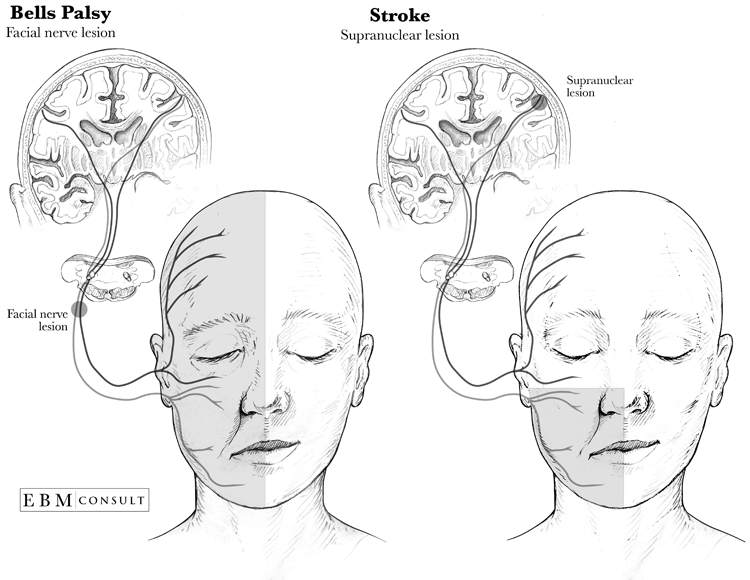 A stroke in many locations in the brain or brainstem can cause facial paralysis. 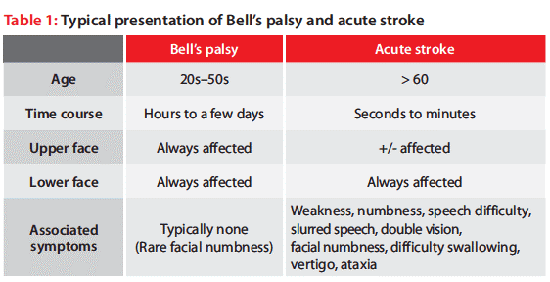 Bell’s palsy and acute ischemic stroke both cause acute facial paralysis; however, maximum severity is reached much quicker in a stroke. The patient is usually unaware of the exact time of onset, but witnesses may be able to help with more information. Arm or leg weakness and/or numbness: Check for signs of weakness/numbness by asking the patient to lift arms and legs. The weakness or numbness can occur on either side of the body. Slurred speech: Dysarthria can be a result of cranial neuropathy. Listen for slurred speech in conversation, or give your patient a few tongue twisting word combinations to repeat. Double vision: Diplopia is caused by a cranial neuropathy that causes a misalignment of the eyes. Check with your patient about their vision, and see if they can move their eyes in all directions. Facial numbness: It is rare that Bell’s palsy will affect the trigeminal nerve, the nerve that provides facial sensation. Facial numbness is symptomatic of a stroke. Trouble with swallowing: Dysphagia is also a sign of cranial neuropathy, as well as brainstem ischemia. Ask your patient if they’ve experienced difficulty swallowing or coughing while swallowing. Loss of coordination: Ataxia may occur if there is damage to the cerebellum or brainstem. Check for incoordination in your patient’s limbs by having them walk, and use the finger-nose-finger test. Vertigo: Cerebellar strokes and brainstem strokes often cause vertigo, the sensation of dizzying motion when there is no motion. Your patient may complain of nausea or a room spinning sensation. Mouth: The patient will not be able to lift his/her smile on one side if the facial weakness is severe. Mild weakness would be indicated by a symmetrical smile, but a flattened nasolabial fold. Both central and peripheral lesions can cause mouth weakness. Eyes: The space between their eyelids, or the palpebral fissure, can be examined to see if one eye is closed more than the other. Asymmetrical eye closure would be caused by facial weakness from a peripheral facial palsy. Forehead: If the patient raises his/her eyebrows and one side does not lift at all, or one side is less wrinkled than the other, and the face becomes asymmetrical, it is indicative of peripheral facial nerve palsy. If your patient presents any of these symptoms along with their facial paralysis, it is likely to be a stroke. If your patient is only displaying patterns of peripherally induced weakness, then it is likely to be Bell’s palsy.